It was nice to get back to a relatively normal school routine this week. Last week, I felt like I was up to my ears in hot dogs and jerky. Nearly 50 lbs later, the butchering is all done. Mommy: That’s right Elisha. Water. Mayim. We have been playing this game all week with every word from nose to dog. His vocabulary is really skyrocketing. I wouldn’t say his pronunciation is perfect yet, but he is producing words on his own now. He also is developing quite the personality. He is completely taken with this hat (love the flower) and acts so silly when he has it on. It’s like he knows how cute he is! It just so happens that we studied Babylon this week in history and in Hebrew Life and Times. 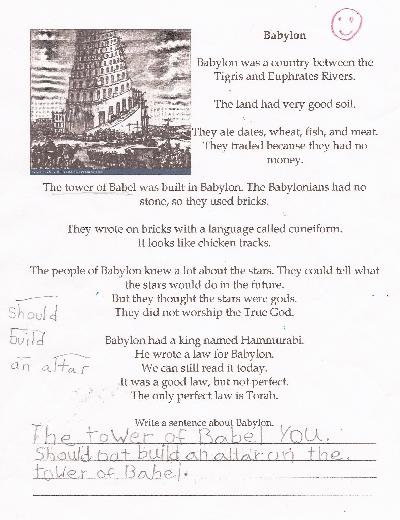 We talked about the Tower of Babel, and how it was essentially a high place for pagan worship. I never thought about it like that before. I also began writing easy to read summaries of our history lessons for Naomi. I want to give her reading practice wherever I can, with varied content. She read through it with just a little help. Babylon kept throwing her. She thought it should say baby-lon. She then wrote a sentence about Babylon all by herself. I then helped her correct any mistakes. This is the beginnings of real writing for her. I’m excited to see how well she is doing. We also did some map work. They have done alot of copywork and labeling in the past. Normally, I write down the words on a scrap of paper and they copy it. This time I orally gave them one letter at a time. They did very well. Sourdough needs to be fed every day, or there are consequences. Some of our children need more help than others. Good communication can solve many of the little problems in life. It’s been a good week! Have a wonderful Shabbat! Shabbat Shalom, Lusi! Looks like life with Ezekiel is just beautiful!